What’s the Featured Game? Medal Tally! If you want to participate in this month’s featured game, we suggest beginning with a good stretch. Medal Tally is a slot that’s tailor-made for long time fans of amateur athletic competitions. In this game, the only thing more rewarding than bringing home a medal is racking up some cold, hard cash. Get ready to run, bike and swim your way to bankroll boosting combinations with this athletically-charged slot from the masters at Real Time Gaming. Begin your Medal Tally experience by loading the game. Luckily, you won’t need to endure the months of taxing training to which traditional athletes must subject themselves. Instead, the only training you’ll need can be done from the comfort of your living room. As with all games, you can practice Medal Tally without putting any money on the line in order to get more comfortable with the combinations. Whenever you’re ready, you can load up a new game with actual wagers and real winnings. There are two important symbols in Medal Tally that can dramatically improve your results. First, there’s the Feature! scatter symbol. Collect three or more on a single spin to win free spins with triple the prizes. Next, there are the Medal symbols. Whether you land gold, silver or bronze, these special symbols serve as wilds that can be substituted for any other symbol in the game except for scatters. Landing a medal or two can play a key role in completing any near-miss combinations. Medal Tally features a progressive jackpot that keeps growing until someone claims the prize. That means that there’s often huge winnings to be had for lucky players. All you’ll need to do to win is activate the free spin feature by collecting three or more scattered Feature! symbols, then collect 50 or more medals during your free spins. 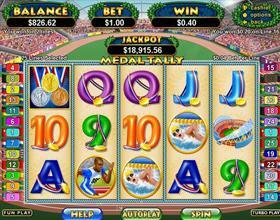 As with any athletic competition, claiming more medals is always a good thing in this exciting slot. Looking for a few insider tips to winning big? Medal Tally is built upon a random number generator, so the results of each spin are impossible to predict. However, there is a way to ensure that you don’t miss out on winning combinations while playing this athletic slot. Play all 25 paylines in order to maximize your chances. From there, you can change your bet per line to meet the requirements of your specific bankroll. Trust us; nothing is worse than missing out on a big win because you failed to bet on a payline. On your marks, get set, spin! Palace of Chance offers over 150 of the online casino industry’s most popular games, but few can compare to the excitement and pageantry available in Medal Tally. Relive your athletic glory days or experience athletic success for the first time. In either case, there’s no substitute for a slot that offers a progressive jackpot and plenty of free games. Now’s the time. Step up to the podium, and claim your prize with Palace of Chance.